Uwe Loesch lives and works in Düsseldorf. He studied graphic design at Peter-Behrens-Werkkunstschule (nowadays called Peter Behrens School of Art). After his exams he started out as free lancing designer in his own studio in Düsseldorf. Today, he is the most acclaimed creator of posters both nationally and internationally. Amongst his regular clients he can count Kom(m)ödchen in Düsseldorf and the Klingspor Museum in Offenbach. Since 1984 many of his works have become part of the collection of the Museum of Modern Art (MoMa) in New York. In 1985 he became Professor for Design at Fachhochschule Düsseldorf; since 1990 he has served as Professor for communication design at Bergische Universität Wuppertal, succeeding Willy Fleckhaus. 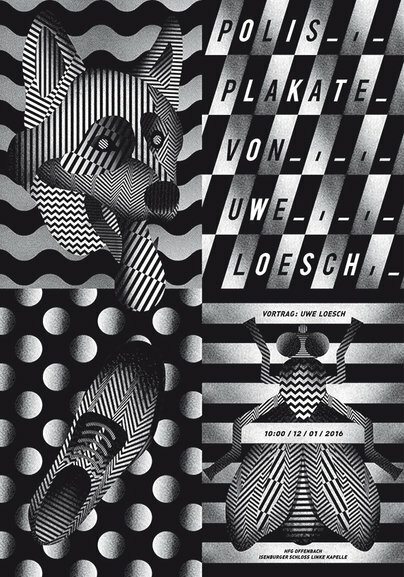 His work focusses on posters and Corporate Design. He has received countless international rewards and is a member of AGI, Alliance Graphique Internationale. In 2009 he was awarded the Gutenberg prize of the city of Leipzig, In 2013 he received the prestigious Design Prize of the German republic for his life's work.